I had a lovely afternoon, definitely continuing my Birthday Octave. Benediction was well attended and I had the chance to try out my monopod: there weren't any instructions on the box, or in the box, and, at first I couldn't get the thing to stay upright. I discovered that I had the foot-rest round the wrong way... well, I am blonde. 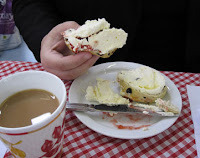 After Benediction, the UCM had a Cream Tea event: we started off with sandwiches, and then there was a choice between fruit salad with ice-cream or scones with strawberry jam and whipped cream. You can see which one I chose. The scones were amazingly light and crumbly, the jam was scrumptious and the freshly whipped cream just finished it off nicely. 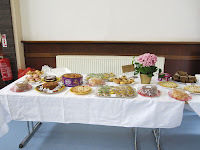 There was a cake stall, but the ladies who were selling the cakes both proved to be camera-shy, and, understanding their reluctance to be plastered over the internet, I waited until they'd moved off before photographing the wares. We have some seriously good cooks in the parish. 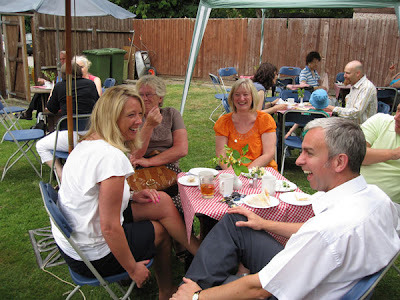 I had planned to buy some cakes with which to finish off my Birthday Octave, but, somehow or other, I got sidetracked... there was a drinks tent in the garden (it was advertised as a beer tent, but, as Jonathan (our senior MC) pointed out, it didn't sell any proper beer) ... I didn't mind, as I was persuaded to try some Pimms. I even ate a bit of fruit which found its way into my glass, so that's my vitamin intake for the month sorted. A rather amusing history lesson... though American history isn't actually something taught in the UK, so I have no idea how accurate a portrayal it is! 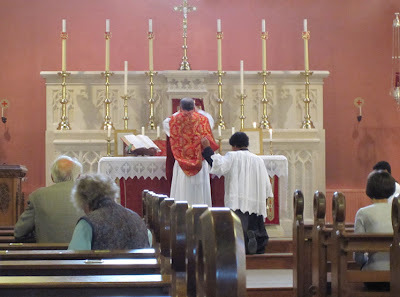 While I'm off, I am doing my best to get to daily Mass. 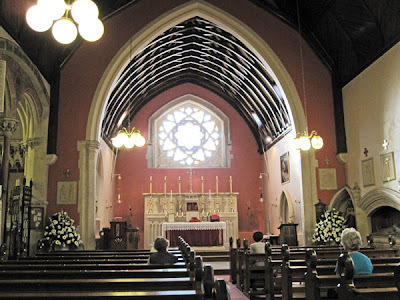 Anaesthetics are dodgy things, after all... Usually it's the morning Mass at Blackfen, but on Fridays there is an evening Mass in the usus antiquior at Chislehurst. This evening's Mass seemed to be too good an opportunity to miss, and so I took a couple of photos. I was sitting rather too far back for my little camera, but use of the zoom helped; it was a struggle, though, to keep the camera still. I really should have used my monopod, but I forgot to bring it with me. The decree of the Congregation for the Causes of Saints recognizing a miracle attributed to the intercession of the Venerable John Henry Newman has been officially approved for publication by the Holy Father. This means that he will become Blessed John Henry Newman. 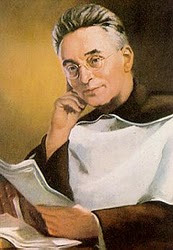 Another miracle is needed before he can be canonised (declared a saint). Speculation is now rife as to whether the Beatification ceremony will be in England or Rome. 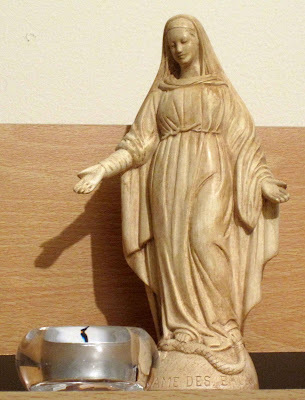 Mantilla-twitch in the direction of Rorate Caeli. 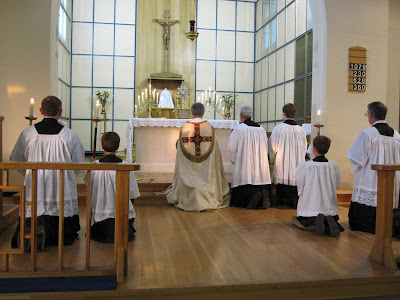 I rather like the traditional Catholic practice of observing an Octave for major feasts. Sunday night isn't good for most people: work looms large for the morning after, which sort of puts a dampener on any celebration, so I didn't actually celebrate my birthday on Sunday. The parish club opens on Thursday evening, however, and quite a few of my friends tend to pop into the club after Rosary and Benediction. I decided I'd celebrate "within the Octave" and went and bought a couple of cakes. Rosary and Benediction was lead by Michael, one of our deacons, as Fr. Tim was busy elsewhere. It provided the perfect opportunity for me to try out my new camera, and so I took a few photos - the only editing these have received is a reduction in file size to make them quicker to load on the blog. When I opened the box, I got a bit of a shock. The camera seemed so small compared with my memory of Fr. Tim's phone, and I was a little unsure whether I could operate the buttons easily as they were really tiny. I then found that the battery pack would take an hour and a half (at least) to charge. More waiting. However, this gave me time to read the instructions. I needn't have bothered: they were extremely unhelpful. The next problem was in the small print: no memory card was included with the camera. And the camera wouldn't save any photos without a card - unlike my mobile phone, it didn't have any "device" memory. It seems crazy that an item which needs a memory card in order to operate is supplied without the memory card in the pack. It is reminiscent of the way in which children's toys in the 1980s came without batteries, and unwary parents then had to endure temper tantrums from children on Christmas Day because there wasn't anywhere to get batteries. To my delight, I discovered that my computer has a special slot for the memory card, so I don't need to fuss about with software and cables. One less thing to worry about. So, now, I want to take photos. 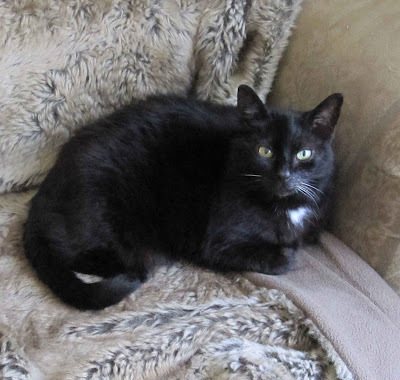 Unfortunately, Sylvester didn't like the sound of the camera (this was prior to my discovery of the "mute" function) and he promptly disappeared through the catflap. You are therefore spared the photos of Sylvester glaring at me. I have always hated having my photo taken. 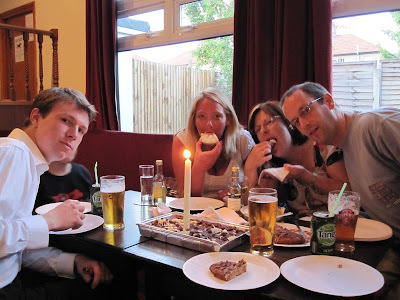 In the whole of my life, I think that I've had only two photos that I actually liked: one was taken at a birthday party (I was in serious pain and hadn't been eating properly, and so I actually had a decent figure, and cheekbones!) and the other was taken (when I wasn't looking) for a college prospectus: I was demonstrating how to dissect a rat diaphragm so it could be used for neuropharmacological experiments... sadly, as the student I was helping was a mature student, it looked as if he was teaching me... and, anyway, the photo never got used, presumably because of sensitivities about animal experiments. Eventually I twigged to the idea that, by taking the photographs, I didn't actually have to appear in any of them. I never quite got to the point of developing my own photos, which was a shame, but then I discovered the joys of blogging... and mobile phones started to come with camera functions. 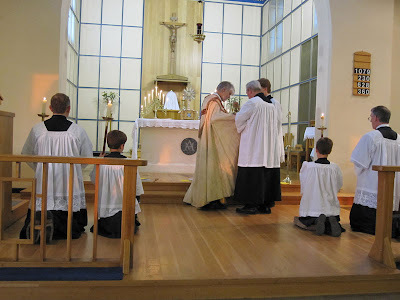 I have enjoyed taking photos more and more over the past couple of years, particularly pictures of Mass celebrated according to the usus antiquior. Fr. 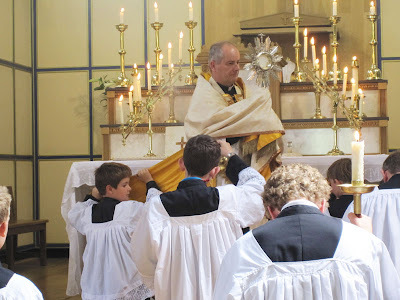 Tim's blog is way ahead of mine in content and readership, but I had the supreme advantage of being able to take photos: priests are rarely in a position to do that! 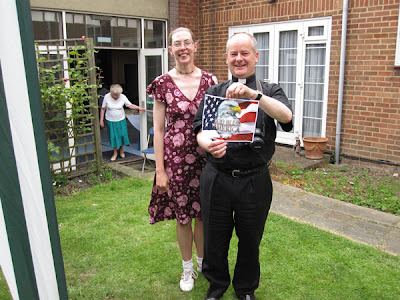 And I have had great fun getting the "key" moments: the genuflections, the elevations, and the occasional blessing. 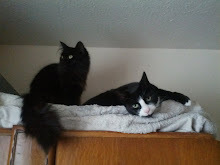 However, lately I have been frustrated in my attempts to take pictures. The mobile phone camera, amazing though it is, has difficulties in low light. I click the button, but the camera takes ages to focus: the photo taken is therefore not the one I want, and it is often slightly blurred because people have moved. So, I decided that a proper camera might be a good idea. But there are so many cameras out there that it's difficult to know what to look for. That difficulty was solved when I used Fr. Tim's small camera to take some photos. It was pocket-sized, as opposed to the big beast he uses for newspaper-quality shots, and appeared to be relatively blonde-proof. I looked up the specifications on the internet, and used that as a guide. I also took Fr. Tim's advice in looking for a camera with a proper viewfinder, as the digital screens are hopeless in sunshine. 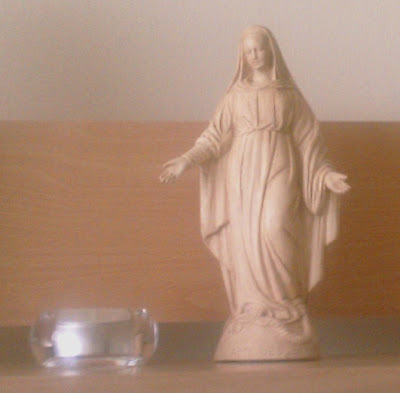 The trip to Lourdes highlighted my dissatisfaction with the phone camera. I resolved to get myself a proper digital camera as soon as possible... and I thought it would make a good birthday present. 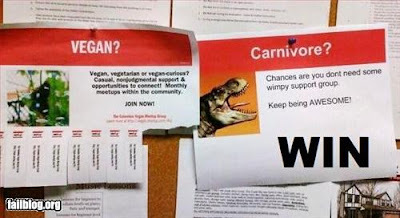 Support Groups... Who Needs 'Em? This open letter, published in the National Catholic Register for the Year of the Priest, has been going round the blogs, and deservedly so. I think it bears re-publishing in its entireity, as it sums up why this year is so important. 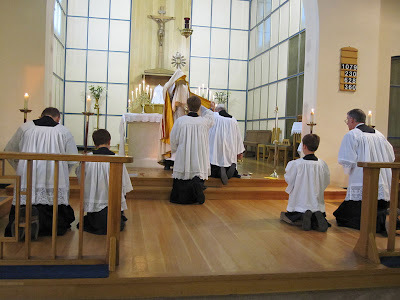 I've said it before, and I'll say it again: No priests = no sacraments = no Church. As the Year for Priests begins, we lay editors of the Register want to take a moment to thank priests. We want to thank not only the priests who have been our friends, but also those we barely knew, who did more for us than our friends ever could. We want to thank not only the priests who inspire us with their words, but also those who moved us more deeply with the daily work of their priesthood than they ever could with words. 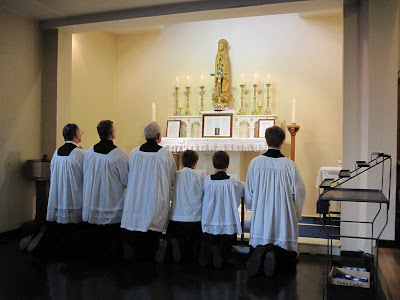 We want to thank not only those men who gave up their retirement, and their well-deserved rest, to enter the priesthood as late vocations, but also — especially — those who as young men saw their whole life ahead of them and handed all of it to Christ. We want to reassure them that the attacks on the priesthood will not prevail, because Christ doesn’t take their kind of generosity lightly. We know that there have been terrible, scandalous priests. This has been true from the beginning — from the original Twelve Apostles through the early Christian heresies, from the scandals before the Reformation to the scandals of the 20th century. But we also know that the priesthood is under attack. Whenever someone looks at them suspiciously, whenever a mother hurries her children away from them, whenever they read an antagonistic article about how the life of a priest makes them prone to become monsters, they know it. Their noble, loving sacrifice is so often made to look ugly and twisted — the opposite of what it is. The whole group is too often defined by the exceptions in a way few of us ever have to deal with. But the priesthood will survive, and grow stronger. In fact, it is already growing stronger. 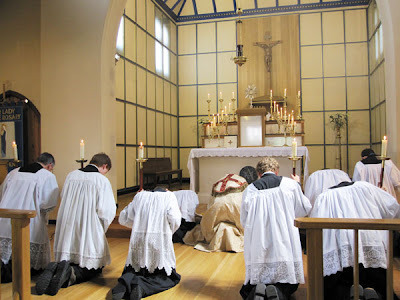 There are more new priests than we have seen in a long time, and the new generation of priests is more committed to the Church’s mission than any in memory. 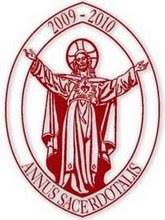 We want to tell the faithful priests who unjustly suffer from these attacks that we’re on their side and, more importantly, remind them what Christ said: Rejoice and be glad on this day, for your name is great in heaven. Thank you, priests, for sacrificing the fulfillment of “making it in the world” in order to give us a chance to make it in the next world. You don’t take on jobs — they are appointed to you. You put your own will at the disposal of the Church, for us. We are grateful. Thank you, priests, for presiding at our marriages, even while you yourselves live such that you can be ready to serve your people at a moment’s notice. Sometimes married people sigh and think envious thoughts about living alone. But in the end, it’s hard for us to imagine how you do it. Thank you for risking loneliness to serve us and our families. Thank you, priests, for putting yourself in the unenviable position of dealing with us at our worst moments — when we’re anxious, upset, depressed, even a little out of our minds, focused on our own problems to the exclusion of all else. When we see the care you have to take in listening to the problems of so many kinds of people, we can’t imagine how you do it. How do you listen to angry people, whining people, weeping people, nervous people, suspicious people and clueless people? 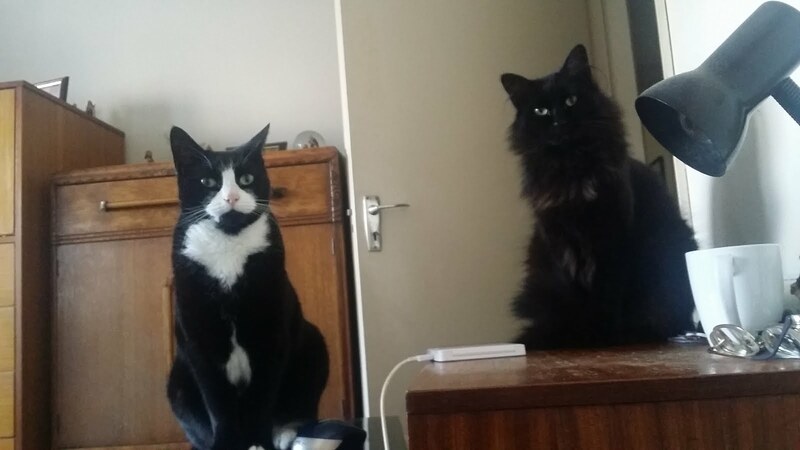 How do you listen to us? Thank you, priests, for sitting in empty confessionals on Saturday afternoons. You wait there, not even knowing if we’ll come, like the Prodigal Son’s father on the road. Thank you for all the times we hear “I absolve you from your sins” and feel a great burden lifted from our hearts. This gift of God’s forgiveness brings the greatest joy back into our lives. We can give you nothing in return that even comes close to that. And thank you, priests, most of all, for bringing Christ himself into our lives. 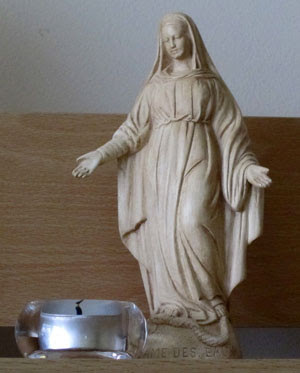 Where would we be without your astonishing ability to make the body, blood, soul and divinity of Christ present on our altars and in our tabernacles? You are there for us every Sunday, every morning, giving us this infinite gift. Thank you. In the end, that’s what is so great about you: not you, in yourself, but who you bring us — Christ. When people need a priest, any priest will do. Because a priest is nothing but a representative of Christ. Christ is the main actor in the consecration at Mass. It is Christ who forgives sins. It is in Christ that we are baptized. Your inadequacy is your secret weapon. You aren’t acting on your own behalf or through your own powers. You are acting for Christ. And that’s why, despite all the attacks, the priesthood will prevail. We depend too much on you to ever let you go. Thank you, Father, for being Christ for us. Twitch of the mantilla to Love Undefiled. The sound quality isn't brilliant, but be patient. As a child, I spent many happy hours observing my mother, who was a very good cook. Alas, my attempts to copy her methods rarely succeeded in producing anything edible, and, on one memorable occasion, my Christmas mince pies were declared a danger to public health, likened to something embargoed under the Geneva Arms Convention, and duly transported, by my mother, directly from oven to bin. To be honest, chocolate cake is rarely as good as it looks: it's generally too dry, and often sinks like lead into the pit of one's stomach. The exception is Schwarzwälder Kirschtorte. It was my favourite for many years, and I would beg my mother to make it as a special birthday treat. The bottom layer should be chocolate sponge (I've also seen it with a chocolate shortcrust base), soaked in Kirsch (a delicious liqueur) - and, since most English "Black Forest Cherry Gateaux" leave out this most vital part, they're always disappointing, as my family discovered when, one year, my stepfather tried to save my mother the hassle of making the cake by ordering one from Harrods. Not a good move. More Kirsch-cherry conserve is added, followed by more cream. The last layer of Kirsch-soaked sponge goes on. 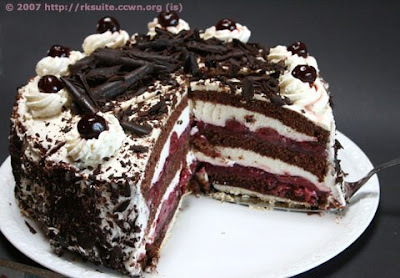 Then the whole cake is slathered in whipped cream, and it's decorated with chocolate shavings (only proper Swiss or Belgian chocolate, the darker the better) and maraschino cherries to pretty it up a bit.